Mexico finds itself immersed within hundreds of disputes over land, native territory, water and shared resources. It is precisely these aforementioned resources that benefit each and every one of us—those of us at present, in addition to generations to come. If we embrace the knowledge of the pueblo [traditional village], we would not only conserve, but would also hold a deep respect for the natural world. At the same time, we would ensure the proper stewardship of our resources, and a full guarantee to others that they would also be able to enjoy them. However, much to our regret, we know that at present, the agendas of those at the top are in opposition to the maintenance and care of our resources. The conflict also seems to lack the appropriate mechanisms to provide for the State’s effective response to the problems suffered by traditional villages and indigenous communities—the result of the imposition of megaprojects, the dispossession of shared natural resources, and the violation of rights as indigenous peoples or campesinos. We have also witnessed the struggle against the lack of consultation [under Mexican and international law, indigenous communities must be consulted about any development project affecting their territory] and their participation in development plans, road infrastructure, or legal reforms that invalidate and ignore forms of organization and management of resources typical to indigenous communities and traditional villages—not only in rural areas, but also in metropolitan and urban areas. “Those at the top put all of their attention into the resources that the war brings to them and none to the suffering they cause. They are effective and efficient presidents, managers, governments, and commanders—who maximize their power and reap the benefits—whether through indirect and unclear ways, or through wars and open measures that they put into play daily, which Harvey called the economy of dispossession. It is, in fact, an economy of plunder, open and concealed, formal and informal, direct or by sub-planting, with formal armies or duly trained, sadistic criminal bands. All of this is at the conscious or unconscious service of networks and corporations that take billions and billions of dollars from the poor and the Earth’s resources (La Jornada, 9/5/15). It is precisely against these managers and commanders at the top that the pueblos respond and organize. They mobilize to prevent them from gaining access, and they resist the attempt to convert their resources into spoils of war. 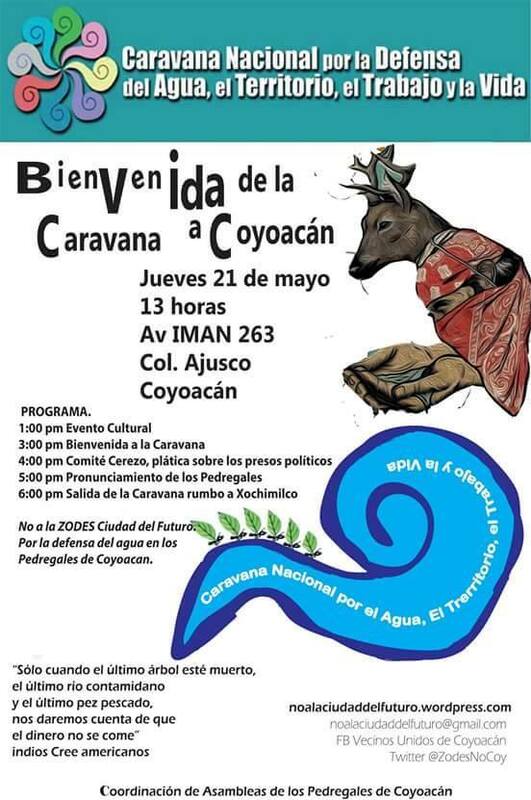 In recent weeks, we have witnessed two revelatory experiences of these movements coming from below: The Caravan of the Fire of Dignified Resistance and The National Caravan for the Defence of Water, Land, Work and Life. 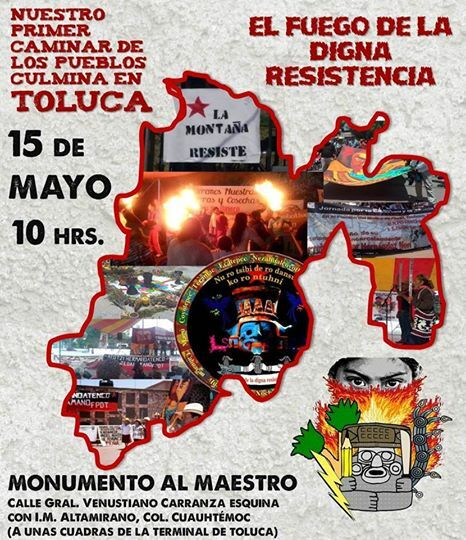 The first was held from April 29 to May 15 and through it, indigenous peoples, traditional peasant farmers, social organizations, independent systems for drinking water, and student collectives are strengthening their struggles. They denounce the imposition of a political and economic project that violates the dignity and identity of organizational forms of the indigenous communities and traditional villages. 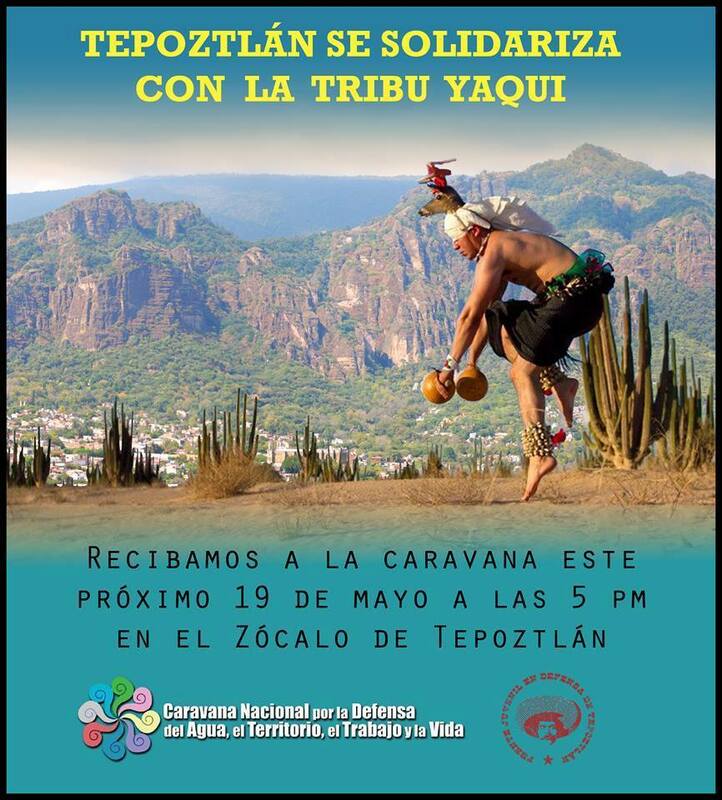 The second caravan is headed by the Yaqui tribe [of Sonora]. 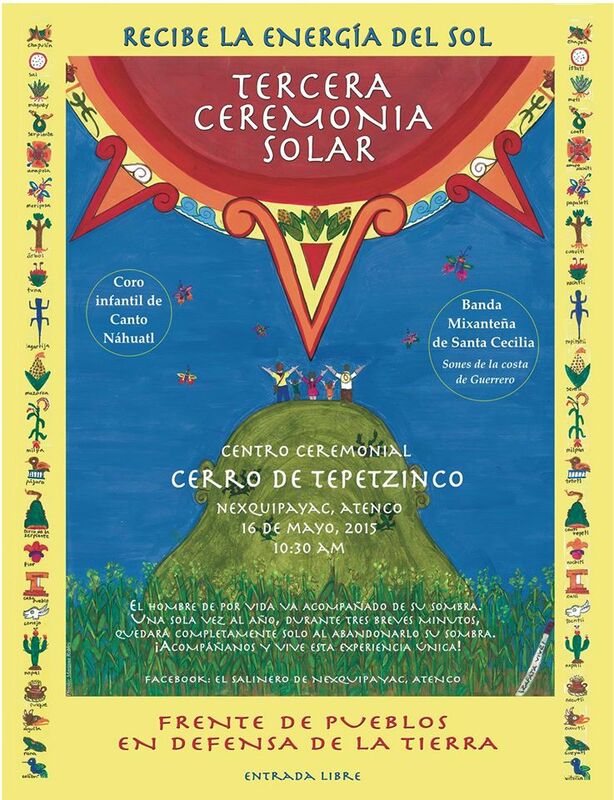 It began on May 11 and is due to arrive in Mexico City on May 22. 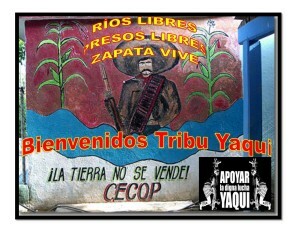 They come from Vicam, Sonora, from Pijijiapan, Chiapas, and others from Piedras Negras, Coahuila. In 11 days, the group will pass through 23 Mexican states, and visit nearly 75 cities and towns. It provides an opportunity for people from traditional villages and indigenous communities that are part of the resistance to exchange thoughts, share experiences, and strengthen their partnerships to address the war that has been declared against them. Interestingly, both caravans—one touring the cities and towns of Mexico, and the other arriving from the north and south to Mexico City—have denounced the widespread dispossession suffered more each day throughout our land. They highlight the imposition of water transfers through the creation of aqueducts, toxic mining, risks associated with fracking, dams, wind farms, pipelines and power stations, as well as deforestation, rampant urbanization, the construction of highways, and the privatization of energy [oil, gas and electricity] and water systems. Participants also bear witness to industrial and agrochemical pollution, and to the control and destruction of our indigenous seeds [via GMOs] and the overexploitation of our workers. Both examples of struggles have arrived at a sense of understanding in their shared pain. They know that the land and water war is already upon us, and yet, you have to recognize that the pueblos are mobilizing despite the fact that the situation that surrounds them is quite bleak. The way in which vigour has been strengthened from below in order to make possible a more dignified and just world is almost prodigious. New times are coming. After the tempestuous war, there will come, without a doubt, a time of justice and dignity. Traditional pueblos and indigenous communities are making sure of this. Will we all join in this struggle? Could it be possible? The answer will be given in resistance against those who intend to take ownership of our shared resources.